"My, oh my!" – a variant of former Angels partner Enberg's "Oh, my! ", used for big, exciting plays. "Swung on and belted!" – used on long fly balls that may go over the wall for a home run. "It will fly away!"' (sometimes "Fly, fly away!") – used for home runs. "Get out the rye bread and mustard, Grandma, it is grand salami time!" – used for a grand slam home run by a Mariners player. "And a ground ball back up the middle! And there it is! He's the new all time hit king in major league history, number two-five-eight! My oh my! "- calling Ichiro's record-breaking 258th hit off of Ryan Drese, passing George Sisler's for the most hits in a regular season. "A-Rod" – first to call Alex Rodriguez "A-Rod"
"The Kid" – Niehaus's name for Ken Griffey, Jr.
Niehaus suffered a myocardial infarction (heart attack) at his Bellevue, Washington home on November 10, 2010, and died at the age of 75 while preparing to barbecue some ribs on his deck. Heart problems had forced Niehaus to undergo two angioplasties in 1996, causing him to give up smoking and change his diet. He is survived by his wife, three children, and seven grandchildren. In a formal statement, Mariners Chairman Howard Lincoln and President Chuck Armstrong said "Dave has truly been the heart and soul of this franchise since its inception in 1977... He truly was the fans' connection to every game." Washington Governor Chris Gregoire said "Today the Pacific Northwest lost one of its sports icons...Dave was an institution here starting with the team's first pitch in 1977. With all due respect to the great Alvin Davis, Dave is 'Mr. Mariner.'" At news of Niehaus's death, tributes came from Jay Buhner, Ken Griffey, Jr., Seattle Mayor Mike McGinn, other Mariners broadcasters, and fans. The statue depicts Niehaus at a desk, behind a microphone, wearing headphones with his Mariners scorebook in front of him. Niehaus is wearing a favorite necktie with tiny baseballs on it and a sport coat. He's holding a pencil in his right hand and wearing the 2001 All-Star Game ring on his left. The scorebook in front of him is open to Game 5 of the 1995 American League Division Series against the New York Yankees. The pages are engraved with Niehaus's actual notes and scoring of the game. The scorebook is so detailed, you even see the word "Unbelievable" scribbled—and misspelled—at the top in Niehaus's handwriting. One person in attendance said Niehaus often misspelled the word because he was writing so fast. "That's unreal", said former Mariner Jay Buhner as he looked at the artistry. That game was won when Edgar Martínez hit a double down the left field line and Ken Griffey, Jr. slid into home. As a tribute to the voice of the Seattle Mariners, Seattle MC Macklemore released a song called "My Oh My" on December 22, 2010. It describes Niehaus's influence on not only Macklemore's childhood, but also on any and all from Seattle. It also features the audio clip from the winning call of the 1995 American League Division Series. When it was debuted by a radio host, he received calls as soon as it was over from Mariners fans who had pulled over on the highway in tears from the lyrical work and memory of Niehaus. Macklemore performed the song for Opening Day 2011 at Safeco Field during the team's tribute to the late broadcaster. 1 2 Mcnerthney, Casey; Spratt, Gerry (November 10, 2010). "Mariners broadcaster Dave Niehaus dies at 75". Seattle Post-Intelligencer. 1 2 "Loss of a legend: Dave Niehaus, voice of Mariners, dies at 75". KOMO News. 2010-11-10. Retrieved 2016-07-21. 1 2 3 4 "Mariners' Niehaus wins Frick Award". MLB.com. 2008-02-19. Retrieved 2008-02-19. 1 2 3 Kepner, Tyler (November 10, 2010). 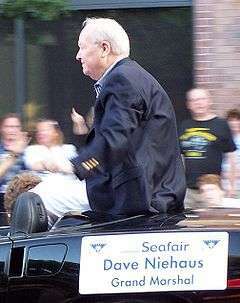 "Farewell to Dave Niehaus, a Seattle Legend". The New York Times. ↑ Baker, Geoff (December 23, 2010). "New song about Dave Niehaus by Seattle rapper Macklemore". The Seattle Times.